Tough As Texas [above] is a very memorable ad by Houston actor and filmmaker Richard Linklater, best known for directing hit films-- mostly about and set in Texas-- like Slacker, Boyhood, Fast Food Nation, Dazed and Confused as well as Before Sunrise, Before Sunset and Before Midnight. It was released this week by the FireTedCruz PAC and is unrelated to the Beto O'Rourke's campaign. But it will probably do Beto a lot of good nonetheless. Make sure you watch it; it's fabulous. Ad Age reported yesterday that the ad "has gone viral, closing in on nearly a million views on YouTube alone [and] it's unlike most of the political attack ads flooding the airwaves and social media these days, in that it's entirely understated (no menacing soundtrack or quick-cut montage of a politician looking shady here). It's perfectly cast. And, well, it's just really funny (particularly at the very end)." The actor is Sonny Carl Davis from Linklater's 2011 film, Bernie. The ad is being shared across social media with a hashtag suggested by the FireTedCruz PAC: #ComeOnTed. Ryan Bort, writing for Rolling Stone, pointed out that the 30 second spot is "beautiful in its simplicity, and strikes to the heart of Cruz’s campaign, which has revolved around the idea that he is more authentically Texan than his challenger. 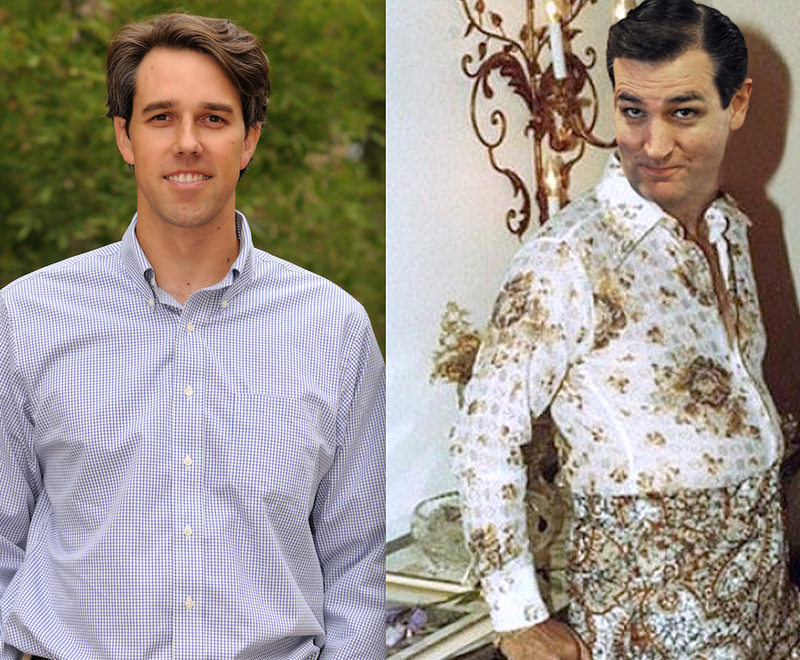 As O’Rourke has risen in the polls, Cruz has relied on cultural appeals, claiming that his opponent wants to turn Texas into California 'right down to tofu and silicon and dyed hair.' He later joked that O’Rourke would work to ban barbecue in the state. But more important to the state’s identity than its culinary offerings is backbone, and, as the ad points out, Cruz hasn’t done much to show he has any. During the 2016 presidential campaign, Cruz was locked in a vicious battle with Donald Trump. In March, Trump retweeted an image implying that Cruz’s wife Heidi was ugly. Cruz retaliated by tweeting a skimpy photo of Melania, prompting Trump to threaten to “spill the beans” on Heidi if Cruz wasn’t “careful.” A few months later, Trump floated the idea that Cruz’s father may have been involved in the assassination of John F. Kennedy, which took place in Dallas. Though Cruz decried the attacks at the time, he has since fallen in line with the rest of the Republican party, cowing to the president at every turn. Linklater’s ad isn’t the first time opponents of Cruz have harkened back to his 2016 tussle with Trump. 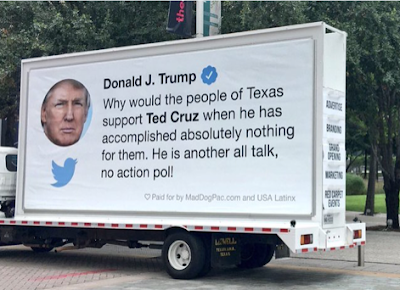 After it was announced that Trump would host a rally in Texas to help resuscitate Cruz’s surprisingly close reelection bid, several people pointed to a tweet in which the president bashed the senator’s record in the state he represents. “Why would the people of Texas support Ted Cruz when he has accomplished absolutely nothing for them,” Trump tweeted in February 2016. “He is another all talk, no action pol!” A group of activists including Parkland survivor David Hogg soon raised thousands of dollars in an effort to turn the tweet into a mobile billboard. Beto is still the underdog in this race, and he still needs help catching up with the tidal wave of right-wing money been poured into Texas on behalf of Cruz. So far Beto and Cruz are neck and neck in what they have raised to fight this battle-- $23,365,836 for Cruz and $23,332,950 for Beto, but far right PACs have put $3,764,273 into a coordinated smear campaign against Beto. So far, Club for Growth has spent $1,104,592 and a shady Texans Are PAC has spent $2,713,867, all of it from right-wing mega-donors like Dallas' Mitchell family, Richard Uihlein of Wisconsin ($450,000), Hushang Ansary and Robert Rowling. Beto has discouraged SuperPACs from getting involved with his race and so far only $33,528 has been spent against Cruz by outside groups. Blue America keeps reminding contributors that all Beto money should go straight to his campaign, never to the DSCC, which is not helping him, or any other groups. 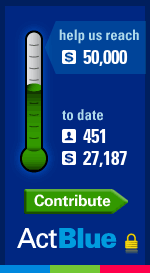 You can contribute to Beto's campaign directly by tapping on the Take Back Texas thermometer on the right.